I recently checked out ACM’s new WebTrader. It seems there are a host of new platforms coming out recently, and this is the latest one. How does it compare? Let’s take a look. The first thing that struck me was its clean look. Definitely cleaner than Metatrader 4. 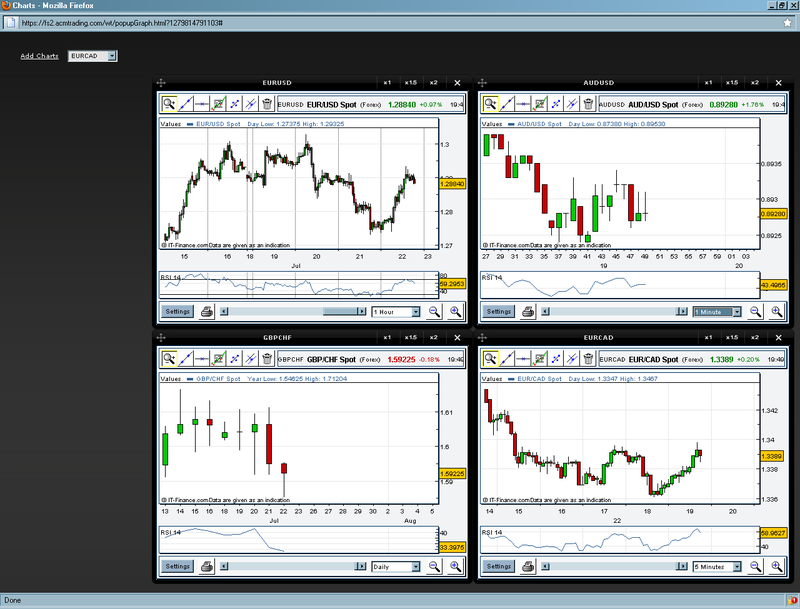 At times MT4 can make the screen look a little clogged up, but with the ACM WebTrader, this isn’t the case. To be honest, it’s probably mainly because the charts and the main info screen are in different windows, (unlike MT4), but despite that, it still manages to deliver an efficient but useful main window, including the latest news, in detail, live quotes, large quote boards, (something which most platforms have), your latest positions, and of course your trade log. MT4 has the latest positions and trade log in the same window but you have to flick between them, meaning you can’t view both at the same time. 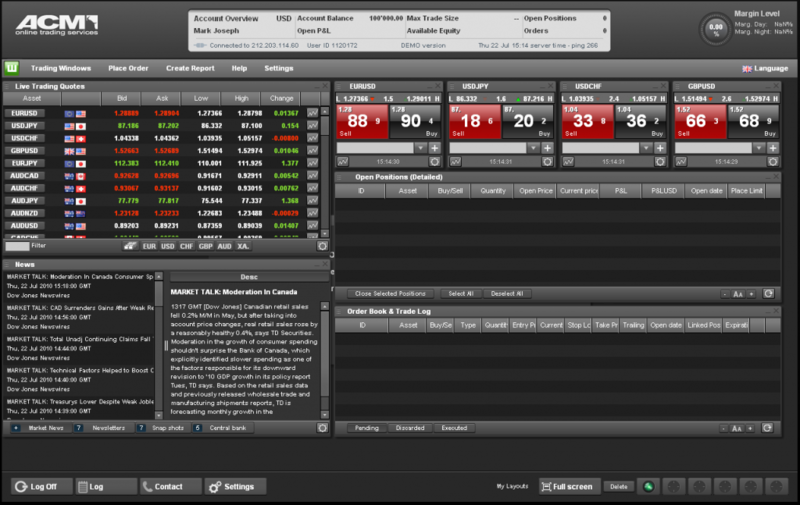 WebTrader however has them in separate windows meaning you can view them simultaneously. Now, when making orders, there’s a few things which I came across which was unique to this platform. The first is something called, a GTC order, meaning Good for the day. A GFD order remains active in the market until the end of the trading day. Now, since forex is an ongoing market, the end of day must be a set hour. For ACM the end of the trading day occurs at exactly 23:00 CET. So basically, it’s a time limited trade, which automatically closes, whether in loss or in profit, at the end of the day. Other types of orders include, the IF DONE type order. This can be really useful, and I’m surprised other platforms don’t have this. Basically, it means, if for example, the trader believes that the EURUSD is going down but will reach a resistance at say 1.3650. At that point, the trader thinks that the market will rebound which is why the trader can place a sell order at 1.3600. This kind of order allows the trader to execute a strategy without constantly being behind the computer. When the execution of an order reduces the exposure on the traded currency-pair, the FIFO (First In First Out) rule will apply, and the oldest position on the traded currency pair is closed or reduced. If the amount of the order is larger than the amount of the closed position, the next oldest position is reduced or closed. This process will continue as long as the entire amount of the order has not been booked. If all positions are closed and there is still an available amount which has not been booked, the order reverses the exposure from long to short (or from short to long). A new position with the residual amount will be created in the opposite direction. There is also something called “linked orders”. This means, orders linked to an open position are called Linked orders. It means that the execution of linked orders will only affect the linked position by closing it. Linked orders are easily configured by the client. The client just has to select a position in the list of all open positions on it and selecting the appropriate order type to close that position. As far as colour customisations go, there’s not really a lot to ACM’s WebTrader. It’s basically the option to have the platform as a dark scheme or a light scheme. The advantage of a web based platform is that no installation is required (apart from Java if you don’t already have it). The problem is however, web based platforms are notoriously sluggish. Nothing can compare for speed to having a local based platform installed on your own hard drive. Having said that, this is actually quite a speedy platform for its web based nature, and I’m surprised at how smooth it was in regards to moving from different windows, clicking different buttons and icons, opening menus, dragging charts. Ok, if you’re used to say, MT4, you’re gonna find this slow, but it definitely holds up well against other web platforms, and it wouldn’t be far fetched to say it’s the quickest of them all. Overall, this is a decent platform, easy to use, with lots of functionality. Obviously it’s missing expert advisors – that’s natural, but for a platform for purely manual trading, it does a good job.